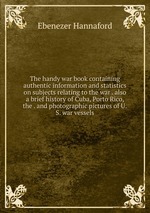 Аннотация к книге "The handy war book containing authentic information and statistics on subjects relating to the war . also a brief history of Cuba, Porto Rico, the . and photographic pictures of U.S. war vessels"